We stayed at The Milking Parlour for another week at the end of March having stayed the year before as well. Once more, our stay was brilliant. The accommodation is well set up, Fiona & Rob are friendly and helpful, and the feeding rounds every morning are brilliant, and our children love every second. Thank you for your review. It’s great you had another fab holiday. The children enjoyed helping bottle feed the lambs and riding the donkeys and getting up close with the other animals. It was great to see you again. Great family holiday away from it all down on the farm. We had a lovely 5 day stay with Farmer Rob, Fiona and their animals - thank you. Lovely welsh cakes and essential supplies on arrival and ever helpful hosts with great animal experiences, playground fun and making new friends was just great. The highlight of the stay there is certainly the morning rounds with Farmer Rob and Fiona feeding and looking after the animals - then the children playing in the playground with their new friends from the other 2 cottages at the farm.....still leaves enough time to go and visit some of the wonderful sights in the area - an awesome castle only 3 miles away - Tenby - who knew!? - Prebery Country Park / Beach - lovely. Highly recommended for young family stays......thanks Fiona and Rob! Had a wonderful stay here with our 1 and 3 year old. Cottage was lovely, clean and well equipped. Fiona & Rob were really lovely and our boys loved going round the farm and feeding and interacting with the animals, a really unique and personal experience. Weather wasn’t great for our week but it didn’t ruin it, would definitely recommend and hope to go back next year. This is our third year running, and our Daughters Aimee's second home. This is the place she loves to be friendly and home from home, loves Rob & Fiona, but her first thoughts are always to Milly, Dom, Meg and Bryn. We stay in the milking parlour, which with her walker is a must for room and easy of use. Thank you for your great endorsement we have been honoured to have you to stay and Millie and Dom have really taken to Aimee and I’m sure it’s nothing to do with the supply of carrots in her walker seat. It’s been great to see her loving the animals and able to get up close Hopefully the changes we’ve made to the Milking Parlour cottage removing wardrobes and moving furniture would give more room for guests with restricted movement and the need for walking aids. Holidaying with a 17 month old is tough..... or so I thought until we visited Cwmcrwth Farm! What an absolute treat! We stayed in the Milking Parlour (sleeps 6) - which is homely, clean, spacious & excellently equipped.... as I imagine all the other cottages are. But what really nailed it for us was the rounds with Farmer Rob & Fiona every morning; leading out the lambs, feeding the goats & pigs, picking up a fresh egg for breakfast, cuddling the guinea pigs & maybe getting a ride on Millie the donkey or in the tractor!! The farm is small enough that there are only a few families staying at one time, so every child gets to have a turn & Rob & Fiona are kind, patient and get to know all the children so they feel really involved. We booked a long weekend for a birthday celebration. Cwmcrwth Farm has become a home from home for us so had a very relaxing stay and we're even blessed with the weather! Rob and Fiona are very friendly welcoming hosts. The daily feeding rounds are fun for children of all ages. There are a wide range of animals to interact and fall in love with. The farm is well equipped with play area and you can also pond dip if you don't want to venture out. The Milking Parlour is spacious with separate large lounge and kitchen areas. There are three bedrooms, one double and two twin. The double bedroom has am ensure toilet/shower and there is a separate bathroom with an over bath shower. In good weather you can sit on the deck overlooking the pond and watch the world go by. The cottage kitchen is well stocked with utensils if you want to cook but there are also lots of good places to eat out a short drive away. 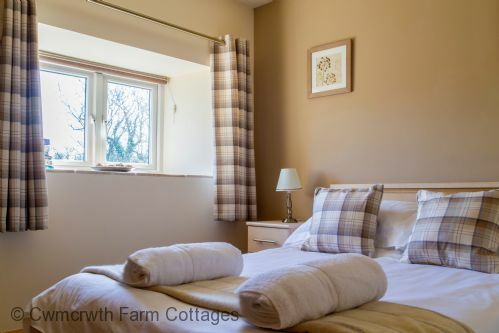 We would thoroughly recommend a stay at Cwmcrwth Farm. Thank you taking the time to leave a review and we are so pleased you enjoyed your weekend at the farm. It's a great endorsement for West Wales, not just us that you have visited so many times and enjoy exploring the great places locally. As your children have grown up you still manage to find fabulous places to eat and visit to suit their age and make more special family memories. We hope you will feel drawn to visit again sometime. Thank you again for being such great and loyal guests. Fantastic time, our little one loved it. We had a fantastic time. Our little one loved waking up each morning and going to feed all the animals, despite the exceptionally cold weather she couldn't wait to go see them all, her favourites were the goats and the rabbits. The play facilities were great and the toys provided indoors were perfect and there was plenty for older children too. Tied in with helpful friendly owners, what more could you want. We had a fabulous stay in the Milking Parlour. Nothing was too much trouble and Fiona kindly sorted out balloons and a cake for my husbands birthday. Rob was great with the kids on the feeding rounds, so much so my son didn’t want to leave! Thanks for a great break. So glad you had a fun time and that the birthday welcome was what you wanted. Thank you so much for staying and driving so far to visit. We hope to see you all again soon and tell Charlie the animals are missing him already. We spent three nights at Cwmcrwth and thoroughly enjoyed ourselves, despite the less than ideal weather in Wales. The place was close to nature yet not too far from major attractions and amenities that we required. Rob and Fiona were excellent in helping our two year old get up to speed with farming duties. Not to mention their two Collies and the entire array of farm animals. Thank you for your review, so glad you enjoyed your stay as I guess the Welsh countryside is very different from Singapore. The Best Holiday - Ever!!! Hard to think where to start with this...... My partner and 20 month old daughter enjoyed a fantastic week here and were brilliantly hosted by the hard-working Farmer Rob and Fiona. Our daughter loved the feeding of the animals every morning and couldn't wait to pull on her wellies and get going. Her favourite time was taking the Sheep and Donkeys to their field and the constant access to all of the animals to say 'Hello', even to the extent of kissing the Sheep! Donkey, Quad Bike and Tractor rides are a must. The accommodation is lovely; clean and tidy with all of the things you could possibly need for your stay. The evenings are a bonus, dark and incredibly quiet, even though we had a TV we spent most nights reading and books and having quiet discussion (unheard of!). There are plenty of things to do within an hour's travel from the farm, including incredible beaches, quaint villages and child friendly attractions to keep the little ones amused until exhaustion kicks in. Thank you so much for such a comprehensive review of your holiday. So glad you had fun and a chilled out experience. We loved having you to stay and enjoyed showing you around the farm and interacting with the animals. A truly special place that feels like home!! Rob and Fiona are wonderful people and we are always made to feel very welcome. They are both brilliant with children and the feeding rounds are amazing!! So pleased you had another fab stay and the weather was nice enough for you to visit Pembrey Country Park and Cefn Sidan beach and to have a BBQ or 2. We love having you all join in feeding rounds in the mornings and we hope to see you all again soon. Thank you for taking the time to leave your review. The best family holiday I've ever had - absolutely wonderful cottage, brilliant animal feeding rounds each morning for my three daughters, and wonderful attractions nearby. Thank you so much for your lovely endorsement. We are really pleased you had a good time and we loved having your family to stay and enjoyed morning feeding rounds with them. Your girls are a credit to you and were fab with the animals. You are right we are blessed with lots of family friendly places to visit I'm sure you had great fun on days out, I know you visited Folly Farm, Tenby and the National Botanic Gardens. Such an unusual 'cottage' to stay in...i.e. A REAL EX- MILKING PARLOUR!!! We needed a place to stay, with our two dogs, at very short notice and Fiona and Rob came to our rescue. 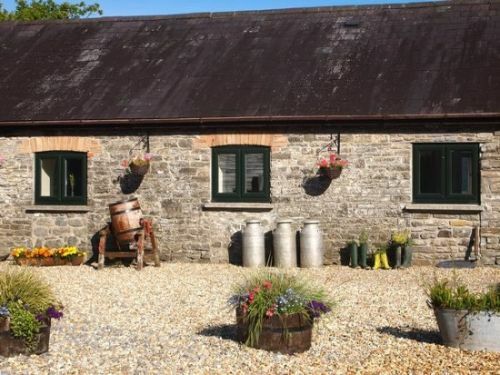 Wonderful 'cottage' - re-used Milking Parlour on old farmyard. Very peaceful and relaxing on a working farm with very friendly and knowledgeable hosts. Thank you both. Really excellent quality self catering accommodation. Spotlessly clean, stylish and well equipped. Warm welcome from the owner - nothing too much trouble. Would like to return for longer. A scorcher of a holiday! Last year it rained, every day. This year what a week, lovely hot weather, and the usual wonderful holiday provided by Fiona & Rob. Aimee has disabilities this is her second home, she loves the Donkeys, the farm and Fiona & Rob. We're always made to feel very welcome, the milking parlour caters for all our needs. Same again next year. Though we have one disappointed young girl who didn't want to come home!! Thank you for your lovely review. The weather was fab although we can't claim credit for that! So glad you had a great break and a relaxing time and were able to take a trip on the steam train in the Brecons, spend a day at Tenby in the sun and visit the Red Kite Feeding Centre. We love having you all to stay especially enjoy time with Aimee on the farm. Dom and Millie will definitely miss her supply of carrots and kisses. Can't wait to see you all again next year. We had an amazing long weekend here. We stayed in the milking parlour and it was great with our 2 yr old being a ground floor accomodation. The cottage was clean and kitchen fully equipped. Our daughter enjoyed her morning animal feedings with Rob. I could see that each day she was getting braver to face the goats and lambs! Rob and Fiona were lovely and gave some ideas on where to go etc., which was very helpful. They also placed a binder with loads of local info and tourist flyers in the cottage. The check in check out times can be revised in our opinion but all in all our daughter had a great little holiday as her birthday treat! Thanks for everything, we hope to visit again. Accommodation was of a good standard as expected. Warm welcome from Rob on arrival. Our children really enjoyed helping Rob and Fiona with the animals each morning. The accommodation is close enough to other attractions to make day trips enjoyable. We had a great time and would recommend this as a holiday booking for other families. Another relaxing and enjoyable stay at Cwmcrwth Farm. It has become a home from home for us and a base for trips we want to make in the area. As always Rob and Fiona were very welcoming and very knowledgeable about things to do and where to eat. The Milking Parlour was clean and comfortable with plenty of room for a larger party than ours. Like many of our guests who make return visits, you have become part of our Cwmcrwth Family. Thank you again for visiting and leaving a review. So glad you got to see the puffins at Skomer this visit as well as seals and porpoises. There's always something new to visit however many times you come to the area. You even had a chance to bottle feed the lambs and cwtch the baby goats although the Cows didn't play ball and give birth. Hope to see you all again. Very enjoyable weekend stay in a cottage on a working farm. Having stayed at numerous hotels and cottages in the Llandeilo area we cannot rate Cwmcrwth Cottages highly enough. We stayed in the Milking Parlour which comfortably sleeps 6 (1 double room with ensuite shower and 2 rooms with twin beds). Kitchen, living room and additional bathroom are ample and well laid out. Every room was very clean. The highlight for our 4 and 2 year olds was the feeding of the farm animals on Sat morning organised by the owners Linda and Rob. A good hour was spent going from animal to animal and the children loved helping out feeding the rabbits, chickens, donkeys and pigs. Linda and Rob were fantastic hosts and we will definitely be heading get back there for future trips. that you would need . Furnishings are good. 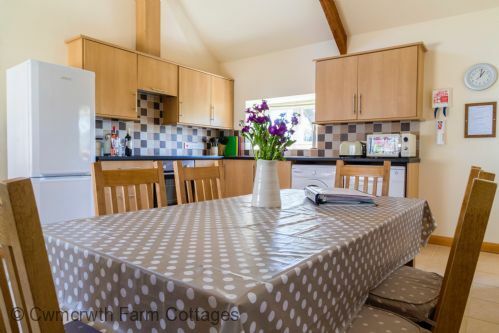 Excellent break for adults and children in peace and quiet yet convenient to Llandeilo and Carmarthen. Thank you for taking the time to leave this review and we are so glad you all had a great time and we lived up to your expectations. It was great having teenagers joining in the feeding rounds and we had as much fun as you! 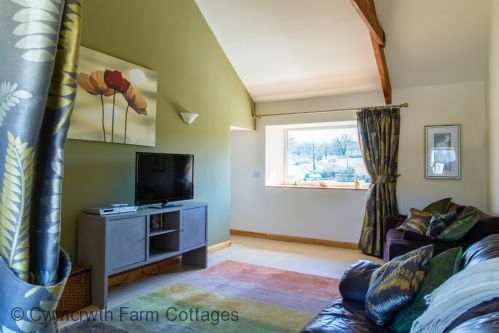 Don't hesitate to book this cottage as the photos don't do the size and location justice. Family of 5 had a wonderful time with Brecon Beacons and anything else you could want within easy reach. Rob and Fiona provide a fantastic time for the children. Rob is particularly wonderful with the children, has a real charm. Every morning they join him on his feeding rounds. Activities involve feeding Mrs Big Bottom (a pig), rides on the quad bike round the yard, going up and down in the bucket of farmer Rob's tractor. There is every type of animal. Also there is a great play ground. Trying to be constructive. It could be even better, the accommodation, while clean and tidy, is not massively comfortable. The furniture is not of the highest quality with squeaky beds, shakey cupboards, tired sofa, etc. The bedrooms are also small, which might be an issue for some. The outside landscaping also looks like it needs finishing, lacking soft landscaping. Zoning of the three properties would be great to have private areas that were yours. It would be wonderful if the Dairy balcony overlooking the pond was actually accessible from the dairy. Overall, they provide a special experience which our kids loved and the stuff slightly below other holiday lets could easily be rectified. We are really enjoyed our weekend stay, many thanks. Booking was easy and the property owners were patient as we decided how many cottages we would need and for how many nights. The accommodation was very clean and comfortable. The pigs were well worth visiting! I chose this venue for our first family holiday due to it promise to be family/toddler friendly and I wasnt dissapointed. The rounds with Farmer Rob were great for adults and kids alike. Our daughter was 19months and loved it, espcially carrying her own little bucket for the chickens and pigs. 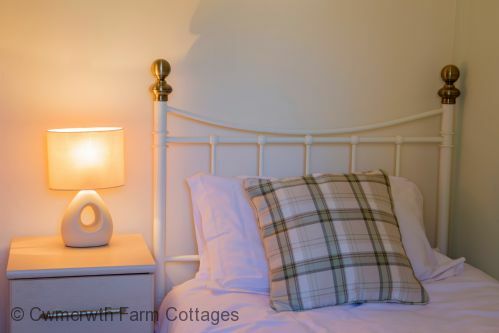 The welcome you receive is lovely and the cottage is extremley well equipped with everything you could want for self catering. 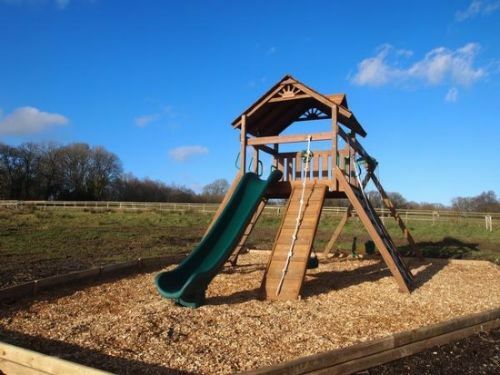 For the days you dont want to go out and about there is plenty to do on the farm with the playground and sandpit, if you can drag the children away from the animals! Second stay here and farm was just as wonderful as me and my family remembered. Each cottage available is just like a home from home, everything you need is there and is very comfortable stay. Rob and Fiona are both very friendly and welcoming, helping on the farm every morning was good fun for everyone, my children range from 6-15 and all enjoyed themselves. Location is great for exploring South Wales and there is lots around to suit everyone. Would highly recommend staying here, I am looking forward to returning in the near future. Our first but certainly not last visit to the farm. The milking parlour was perfect for us and our daughter. She uses a Rollator walker, I use crutches, but other than 2 small steps into the bungalow it was ideal for our needs. Fiona & Rob were extremely helpful, and giving in their time to Aimee. They had not met her before but with plenty of liaisons between us, they fully understood her wishes for meeting and helping with the animals, working within her limitations both of which were exceeded. We're already looking forward to next year, and can't wait to be back. A huge thanks to you both. We have just returned from a wonderful week staying in the Milking Parlour at Cwmcrwth Farm. The children (5 &2) both had the most amazing week with the daily highlight being the feeding rounds with Farmer Rob. Rob and Fiona were so welcoming and the boys were free to visit the animals throughout the day - something my pig-loving toddler made sure he did! The whole farm is ideal for families. It has a lovely play area with a separate section for the under fives. The kids spent hours playing there with their new friends. There is also a swing ball set that my elder son enjoyed. There is a large pond and selection of fishing nets available to visitors and my eldest son developed an obsession with pond dipping over the week. Both the boys particularly enjoyed the junior farmers day that offered a full day of activities on the farm including the usual feeding rounds, mucking out the pigs, donkey rides and the chance to ride on the tractor and quad bike. All topped off with some lovely homemade cake! The day was brilliant and by the end of it both boys were exhausted. Farmer Rob was wonderful with the children, taking the time to make sure they were all included and all their questions got answered even when he was being bombarded from all sides. The farm location is great. We had some wonderful day trips out including a day at the beach, a trip on a steam train and a visit to the National Trust estate at Dinefwr Park. All of these were less than an hour away and ideal for young children. By the end of the week we had two budding farmers on our hands - I am sure we will be booking our return visit very soon! Thank you Rob and Fiona for a wonderful half term. Beautifully presented, clean and spacious. Everything we would need was at arms reach. Lovely setting with fantastic views and we got a real feel for living on a farm. Thank you! 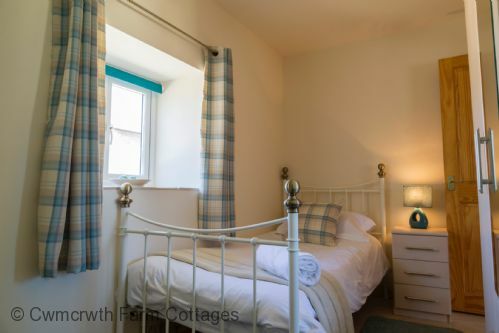 Great location, super cottages ideal for a break with other family/friends. Gorgeous local toiletries! Efficient booking and communication, all information provided on request. Would recommend. we stay for one eweek . was perfect . great stay. Everyone went out of their way to make sure we had a good time, and we certainly did in lovely surroundings- the girls are still talking about their stay in the pig sty! What a birthday treat for Issey and even the 14 year old boys put their phones down and embraced the farmyard experience- especially jumping around in the haybarn!